This article provides a map, facts and information about the 5 Regions of the United States. The United States is usually divided into five major regions - the Northeast, Southeast, Midwest, Southwest and Western State regions. 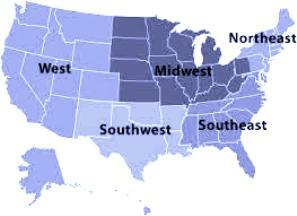 The 5 Regions of the United States map provides a fast overview of the physical and geographic location of the five regions and its state divisions. Discover facts and information about the names of the states in the Northeast region, Southeast region, Midwest region, Southwest region and the West region. The 5 Regions of the United States map provides a bird's eye view of the United State of America. Test your knowledge of the USA with a fast, fun State Maps Quiz Game for those learning about the geography of America. 5 Regions of the United States - What are Regions? A region consists of areas of land that have common features. The 5 Regions of the United States map show that according to their geographic position on the continent. The regions have natural, geographic features in common such as forests, wildlife, or climate. The West comprises of the mainland states of Colorado, Wyoming, Montana, Utah, California, Nevada, Idaho, Oregon and Washington. The San Andreas fault line makes the West region the most susceptible to earthquakes. The landscape and climate between these regions vary considerably. Some have dry, flat areas with sandy beaches and others have wet, mountainous areas. Alaska and Hawaii are also included in the west regions although, due to their physical and geographic locations, their climate and landscapes are completely different. The following list provides a list of the States in the West region together with their capital cities. The Southwest regions comprises of Texas, Oklahoma, New Mexico and Arizona. These regions are dominated by their arid climate and desert landscapes and mountain peaks. The climate, physical and geographic features have produced breathtaking scenery in the Grand Canyon and the unique landscape of the Monument Valley and the Painted Desert. The following list provides a regional list of Southwest region, together with the State Capitals. The Midwest states consist of Ohio, Indiana, Illinois, Wisconsin, Michigan, Minnesota, Iowa, Missouri, Kansas, South Dakota, North Dakota and Nebraska. The climate, temperature and rainfall varies from state to state. The notable physical and geographic features include the Bad Lands, a region of small, steep hills and deep gullies created by the process of erosion and the Black Hills mountain range in South Dakota. The Midwest is known as the as the "Breadbasket of the nation" producing important crops such as wheat, corn and oats. The following list provides a regional list of Midwest, together with the State Capitals. The Southeast states consist of Kentucky, Virginia, West Virginia, Tennessee, North Carolina, South Carolina, Georgia, Florida, Arkansas, Alabama, Louisiana and Mississippi. The climate in the Southeast is temperate with high levels of rainfall. Once famous for its plantations agriculture is still the main industry of the South. The following list provides a regional list of Southeast, together with the State Capitals. The Northeast states consist of Maine, Vermont, New Hampshire, New York, New Jersey, Connecticut, Rhode Island, Maryland, Delaware, Pennsylvania and Massachusetts. The Northeast includes the New England and the Mid-Atlantic states. Although famous for its large cities and industries the region also has mountains and forests. The New England region consists of Maine, New Hampshire, Vermont, Massachusetts, Connecticut and Rhode Island. The Mid-Atlantic states include New York, New Jersey, Pennsylvania, Delaware, and Maryland. The Northeast is the location of the Nation's capital, Washington, D.C. The following list provides a regional list of Northeast, together with the State Capitals. We hope that the interesting facts and information provided on the 5 Regions of the United States will help kids and school children with their homework. Learn more about the 5 Regions of the United States Map by playing the State Maps Quiz Game.